Production: Metro-Goldwyn-Mayer Pictures Corp.; black and white, 35mm; running time: 110 minutes. Released 3 November 1939. Rereleased 1947. Filmed 19 May 1939–16 July 1939 in MGM studios. Producer: Ernst Lubitsch; screenplay: Charles Brackett, Billy Wilder, and Walter Reisch, from the story by Melchior Lengyel; photography: William Daniels; editor: Gene Ruggiero; sound recording director: Douglas Shearer; production designer: Edwin Willis; art director: Cedric Gibbons; music score: Werner R. Heymann; costume designer: Adrian. Cast: Greta Garbo ( Ninotchka ); Melvyn Douglas ( Count Léon d'Algout ); Ina Claire ( Grand Duchess Swana ); Sig Rumann ( Iranoff ); Felix Bressart ( Buljanoff ); Alexander Granach ( Kopalski ); Bela Lugosi ( Commissar Razinin ); Gregory Gayle ( Count Rakonin ); Rolfe Sedan ( Hotel Manager ); Edwin Maxwell ( Mercier ); Richard Carle ( Gaston ). Brackett, Charles, Billy Wilder, and Walter Reisch, Ninotchka , New York, 1966; edited by Richard Anobile, New York, 1975. De Acosta, Mercedes, Here Lies the Heart , New York, 1960. Conway, Michael, The Films of Greta Garbo , New York, 1963. Weinberg, Herman, The Lubitsch Touch: A Critical Study , New York, 1968, 1983. Viertel, Salka, The Kindness of Strangers , New York, 1969. Zierold, Norman, Garbo , New York, 1969. Kanin, Garson, Hollywood , New York, 1974. Corliss, Richard, Talking Pictures: Screenwriters in the American Cinema 1927–1973 , Woodstock, New York, 1974. Corliss, Richard, Greta Garbo , New York, 1974. Whittemore, Don, and Philip Alan Cecchettini, editors, Passport to Hollywood: Film Immigrants Anthology , New York, 1976. Zolotow, Maurice, Billy Wilder in Hollywood , New York, 1977. Affron, Charles, Star Acting: Gish, Garbo, Davis , New York, 1977. Sands, Frederick, and Sven Broman, The Divine Garbo , New York, 1979. Walker, Alexander, Greta Garbo: A Portrait , New York, 1980. Linton, George, Greta Garbo , Paris, 1981. Paul, William, Ernst Lubitsch's American Comedy , New York, 1983, 1987. Ernst Lubitsch , Paris, 1985. Bowman, Barbara, Master Space: Film Images of Capra, Lubitsch, Sternberg, and Wyler , Westport, 1992. Hake, Sabine, Passions and Deceptions: The Early Films of Ernst Lubitsch, Princeton, 1992. Eyman, Scott, Ernst Lubitsch: Laughter in Paradise , New York, 1993. Harvey, James, Romantic Comedy: In Hollywood, from Lubitsch to Sturges , Cambridge, 1998. New York Times , 16 April and 10 and 19 November 1939. Variety (New York), 11 October 1939. Garbo, Greta, and Ernst Lubitsch, in New York Times , 22 October 1939. Newsweek (New York), 30 October 1939. Sight and Sound (London), Winter 1939–40. Monthly Film Bulletin (London), 31 January 1940. New Yorker , 29 June and 10 August 1940. Variety (New York), 29 October and 5 and 26 November 1947. Lengyel, Melchior (interview), in New York Times , 4 January 1948. Pozzi, Gianni, "Parere su Lubitsch," in Critica Cinematografica (Parma), May 1948. Weinberg, Herman, "A Tribute to Ernst Lubitsch," in Films in Review (New York), August-September 1951. Paolella, Roberto, "Ernst Lubitsch, regista del tempo perduto," in Bianco e Nero (Rome), January 1958. "Lubitsch Issue" of Film Journal (Melbourne), June 1959. Cutts, John, in Films and Filming (London), March 1962. Whiteball, Richard, "Garbo—How Good Was She?," in Films and Filming (London), September 1963. "Lubitsch Issue" of Cahiers du Cinéma (Paris), February 1968. Sarris, Andrew, "Lubitsch in the 30s," in Film Comment (New York), Winter 1971–72. Mast, Gerald, "The 'Lubitsch Touch' and the Lubitsch Brain," in The Comic Mind: Comedy and the Movies , Indianapolis, 1973. Trueba, F., in Casablanca (Madrid), May 1983. Amiel, V., "Paroles de Billy Wilder, 'touch' de Ernst Lubitsch," in Positif (Paris), September 1983. Mindich, J., "Re-reading Ninotchka: A Misread Commentary on Social and Economic Systems," in Film & History (Coral Gables, Florida), no. 1, 1990. Gensler, Howard, "Détente: Ninotchka Directed by Ernst Lubitsch and Starring Melvyn Douglas and Greta Garbo," in Premiere (New York), vol. 3, no. 10, June 1990. Rosterman, R., in Hollywood: Then and Now , vol. 25, no. 7, 1992. Beller, J.L., "The Radical Imagination in American Film," in Creative Screenwriting (Washington, D.C.), vol. 1, no. 4, Winter 1994.
" Ninotchka ," in Premiere (New York), vol. 12, no. 3, November 1998. The advertising campaign for Ninotchka is proof of a publicist's faith in the collective amnesia of the American public. "Garbo Laughs" was treated as momentously as was "Garbo Talks," the slogan that announced her first sound film, Anna Christie . The marketing of Ninotchka takes no account of Greta Garbo's frequent laughter, her smile and the lightness of her touch throughout her 1930s films. Just three years before, in Camille , playfulness and humor inflect her doomed "lady of the camellias." Ninotchka is, however, her first comedy. Its principal comic ploy is a paradoxial reflection on Garbo as actress. Here she is made to play, through the first part of the film, a woman who apparently has no emotions. Audiences must read this as they would a scene that suggests that Fred Astaire is clumsy or that John Wayne is a coward. Ninotchka extracts much of its humor from the deadpan expression of an actress whose presence is a sign of deep emotional resonance. The story of the rigid, businesslike commissar who awakens to luxury and love in Paris is coherent with director Ernst Lubitsch's stylistics. His major films demonstrate the connections between an elegance of decor, elegance of manner, and elegance of the heart. The film's narrative pretext is the sale of jewels; Ninotchka falls in love with an absurd hat just as she falls in love with Léon. Much humor is drawn from the contrast between a lush Parisian hotel and the austere Moscow room Ninotchka shares with a cello player and a streetcar conductor. As is usually the case in the films of Lubitsch, the comedy reflects back upon the characters. The director uses the comedy of manners to authenticate and dramatize the feelings of the protagonists, and in this, he is at odds with the hard-edged, satirical bent that is characteristic of the writers of Ninotchka , Charles Brackett, Billy Wilder and Walter Reisch, a mode that becomes particularly apparent when Wilder turns to directing their scripts. The appeal of Ninotchka is in the mix of talents, from Garbo's emotional complexity, to Lubitsch's wry sentiment, to the writer's acerbic wit. The range of the performances includes the broadness of the three bumbling commissars and the drawing-room bitchery of the Grand Duchess Swana (to which Ina Claire brings her distinctively brittle sophistication). Melvyn Douglas provides the pratfall that inspires Garbo's celebrated laugh, and the warm charm that inspires her love. Very successful at its release, it seemed to promise a new direction in Garbo's faltering career. Her next and final film, Two Faced Woman , also co-starring Melvyn Douglas, proved that considerable comic talents also require a comic script. 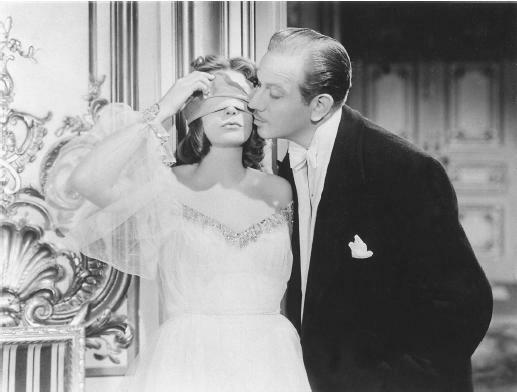 But Ninotchka was reborn, first as a Cole Porter's Broadway musical, Silk Stockings , with film stars Hildegarde Knef and Don Ameche, and then as a musical film with Cyd Charisse and Fred Astaire. Ningen No Joken La Noire de . . .